I love sock crafts! Interestingly, I've seen people young and old, crafty and not so crafty enjoy them too. ANYONE can make them... there's really no learning curve at all. If you'd like to share the fun of making sock animals, specifically the sock bunny... you'll love this homemade gift idea for sharing sock crafts. Also, if you like thrifty homemade gifts, here you go! Chances are, you'll have everything you need on hand to create these unique little homemade Easter gifts. 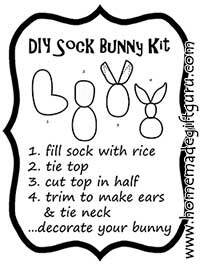 ...or this one for making a small sock bunny rabbit using baby socks. Want to make this idea super cute and very thrifty? 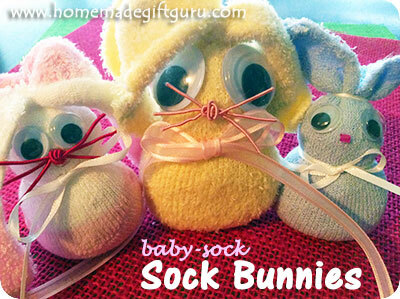 Make your sock bunny activity kits using baby socks, rather than adult-size socks. For one thing, the baby sock bunnies require a lot less rice than the original sock bunny... this makes them easier to pack in a small jar and more thrifty if you are making several. Plus baby socks are super inexpensive... If you're a parent or grandparent, you might have baby socks around that are missing their pair or outgrown (baby socks often don't get worn long and tend to stay in pretty good shape since babies grow so fast). If you don't have baby socks around, dollar stores often have a variety to choose from, often in packages of 3... which will make 6 kits. 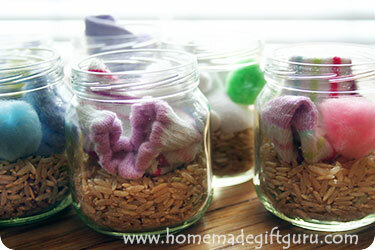 Keeping with the theme of re-using baby stuff that you might otherwise throw away... baby food jars also make great gift containers for these little sock craft kits. If you don't have access to baby food jars, I suggest recycling other small jars (small jelly jars or fancy mustard jars for example), or 1/2 pint mason jars will work. 2. 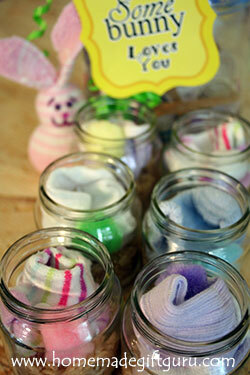 Fill each jar with the supplies for one sock bunny per jar. 3. Print the instruction tags provided. 4. 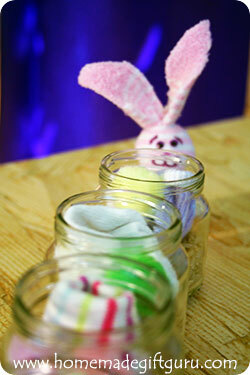 Attach tags to jars using ribbon or raffia. 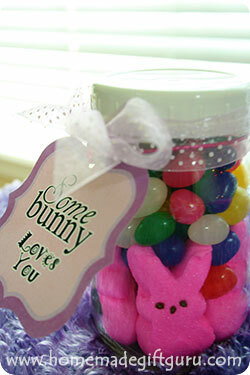 Optional... Baby food jars, mason jars and jelly jars often have cute lids that work well for this homemade gift idea. If the lids for your jars need a makeover, you can decoupage pretty paper onto the lids. 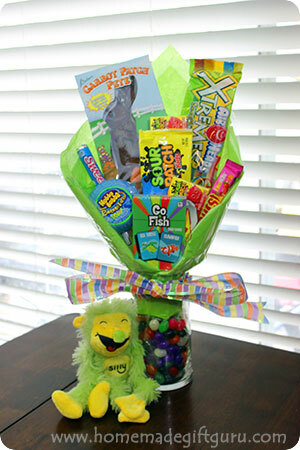 Put your homemade sock bunny kits inside your Easter gift baskets or simply give them to friends and family for unique little homemade Easter gifts.